It has been a long time since the last burger shootout. Part of the reason for the delay is that I've eaten so many burgers that I'm a little sick of them. The other reason for the delay is just that I have had less time to travel around to the various burger restaurants. The other issue is last time I did a burger shootout, I said that my scoring methodology for fast food burgers was a little off. Thus, I'm posting the first shootout again with the updated scoring system as well as two new additional trucks. Also, if anyone wants an opportunity to be on TV, Eat Street will be shooting some of San Diego's Gourmet Food Trucks this coming week. If there was one food that epitomizes the hunger that San Diegans have, it's the burger. While outsiders might think that San Diegans go crazy over the fish taco, the true food that all San Diegans love is the burger. It's so in demand that every restaurant has to have a burger on their menu. Naturally, it only makes sense for an intrepid blogger as myself to embark on a journey of adventure and discovery to find San Diego's best burger. 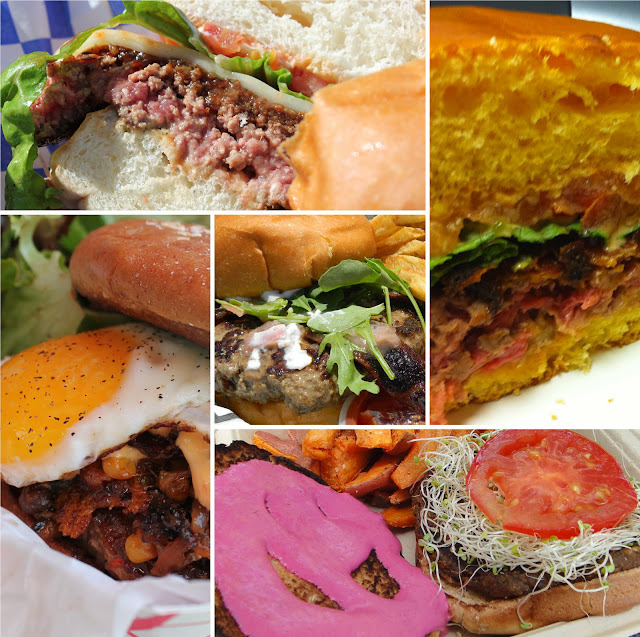 However, with the format of this blog, it wouldn't be fair to pick one best burger. Therefore I have decided to pick the best burger in each of the following "tiers": food trucks, fast food, casual dining, restaurants. In the coming months, I will have a series of "burger shootouts" where I compare the burgers from all of these levels on some set of criteria, which will vary by each tier. I've decided to try and revise the overall scoring mechanism by first normalizing scores within each category and then weighing the categories. The three categories I've settled on are taste, value, and miscellaneous. Within each gourmet food truck burger evaluation, the category weights will shift based on the category where the burger lies. The taste category covers aspects concerning taste including overall taste, taste of each individual component, and cooking temperature. The value category is simply the amount of food received for the money (including sides). Finally, the miscellaneous category covers the items that are inherent to the category of the challenge. Additionally to qualify for this shootout, the truck needed to serve an actual burger of some form. I also decided that instead of trying to order the same burger at each food truck, I would allow each truck to serve me what they considered to be their signature dish. In the following section, I will give a brief overview of each of the contenders (in alphabetical order) in the shootout. Bitchin' Burgers is one of the newer food trucks in San Diego. As the name of the truck suggests, they specialize in burgers. What is not said is that they specialize in burgers made of grass fed beef. I did some searches to find out more about who owns and runs Bitchin Burgers, but the information does not seem to be readily available on the web at this time. I've previously covered Devilicious in this blog, but since I last covered them, demand has them creating a new burger of the week every week for the menu. Additionally, since the last time I covered them, there has been some staffing changes. Chef Dyann HuffmanManning now fully owns and operates Devilicious while her husband Mark operates little brother truck Kalbiq. The Gooch is possibly San Diego's newest gourmet food truck. Like Bitchin Burgers, not much comes up in a search about the owners of The Gooch. The Gooch seems to be focused on bar food, which fits their modus operandi as they frequently can be found serving food to bars. What attracted me to The Gooch was their naming convention on their two signature dishes; The Goochie Pop and the Goochie Mama. While many food trucks try to portray an environmentally friendly image by using local and organic ingredients, the Green Truck is truly environmentally friendly. The truck runs on recycled oil and their kitchen is solar powered. The Green Truck isn't actually a single truck, but a collection of three trucks that run in LA, OC, and SD. Their signature dish is an all made from scratch veggie burger called The Mother Trucker. While many of the trucks in this shootout are newer trucks, MIHO is one of the first gourmet food trucks on the San Diego scene. MIHO is run by Kevin Ho and Juan Miron (hence MiHo from the first two letters of each of their lats names) and focuses on organic and local produce. Miron and Ho both worked in the kitchen of the popular North Park restaurant, The Linkery before deciding to partner up to purchase the food truck. MIHO's menu changes weekly but has always included some form of grass fed burger. Curiocity is run by Chef Jason McAllister who is partners with Chef Antonio Friscia of Stingaree. The focus on the food is to provide seasonal, sustainable, and organic restaurant quality food on the truck. Chef McAllister previously worked with Chef Friscia in the kitchen for five years before opening the truck. Their signature dish is a king crab risotto called the deadliest catch. Eat at Recess is a truck that focuses around bringing the nostalgia of playing in an elementary school playground back to the streets. The food is high class variants of what you would have expected to find in your elementary school cafeteria and there is some adult playground fun built into the truck itself. This burger from Devilicious was the best burger I had eaten this year when I tasted it. The pasilla chili added a nice depth of flavor and was only mildly spicy. The sweetness of the corn juxtaposed with the spiciness of the pepper was very welcome flavor combination, especially when paired with the grilled onions for additional depth of flavor and the earthiness of the oozing egg yolk to marinate all the flavors together. Additionally, Chef Manning prepared my burger to a perfect medium rare maximizing the juiciness of the meat. Eating this burger was like listing to a Linkin Park hit. Disclaimer: I was suffering from some palette fatigue when I tried this burger as I had already had another burger and alcoholic beverages, so I've gone ahead and bumped the taste portion up a little to compensate for that. I was excited for The Goochie Pop because people seemed to like the reviews for it. I was also intrigued by the "bacon jam." Ultimately, I was disappointed. They took my "as rare as you're willing to go" statement a little too far and served a rare burger. This wouldn't have been a problem except they didn't seem to get a good sear on the outside of the burger, so the burger was completely lacking the charred goodness that is expected from a burger. I also felt that for a rare burger the meat to fat ratio was probably more of a 90-10 than the expected 80-20 as even the rare burger wasn't very juicy. Finally, there either wasn't enough bacon jam or the flavor of it just wasn't intense enough to not be drowned out by the thickness of the bread. The burger from The Gooch was similar to the famous Dramarama song as the lyrics (or the bread in this case) was so thick that it distracted from the other elements of the song. The mother trucker sauce seemed to be a combination of beets and something else. The beets gave it the red color as well as the sweetness. Overall, the burger was pretty enjoyable for a veggie burger. However, it distinctly lacked the juiciness and the savoriness in a regular burger, which totally removed a lot of the enjoyment for me. The trucker sauce, although it tasted good, was a little too thick and dripped around while eating. The burger from the Green Truck was like listening to a classic rock song where the lead vocalist is female instead of male. It's been awhile since I had this burger, so I don't remember exactly what the topping was. From the photo it looks like a brie burger with mixed greens and bacon. When I ordered this burger, I was extremely happy with the result. I had previous meals from MIHO where the burger was mediocre at best and I felt swindled for paying as much as I did. Of all the burgers I tried, this was probably the closest to a standard american cheeseburger, and sometimes all you want is the standard burger executed to perfection. This burger reminded me an all time rock and roll classic. The Curiocity Catering burger takes a Brandt Beef patty and tops it on a potato bun and features the traditional toppings from local producers. While the burger seemed like a good idea, it suffered from horrible execution. My patty was cooked to be well done, which really ruined the burger for me. I was excited about the Eat at Recess concept when I heard about it. Paired with grass fed beef, I thought that the formula would be the recipe for a home run. Unfortunately, when I tasted the burger from Eat at Recess, I was disappointed in the results. The main issue with the food is that while all the individual components are good, the meat to bun ratio is heavily skewed in favor of the bun, which unbalances all the flavor combinations. Additionally, despite having a conversation with the owner about rare meat in juicy burgers, my patty came out somewhere closer to the medium well side. From these results, Devilicious took a narrow victory over the surprisingly showing of the Green Truck. Devilicious scored high in the taste, but nearly lost the shootout due to the mess that was created from eating the burger. The Green Truck scored high in the value segment where other trucks struggling, making up for the above average taste, possible suggesting that the weighting of the scoring system may have been inaccurate. Following in a close third was MIHO, which had a great burger, but was undone due to the pricing of their burger. In the lower tier, we had The Gooch, Bitchin Burgers. Curiocity Catering, and Eat at Recess. Originally The Gooch offered tater tots with the burgers, which would have increased the value score, but since there were no tots, they fell out of competition. I also didn't order any sides from The Gooch, who perhaps needs to add some more compelling sides than just onion rings. The truck that needs the most work in my opinion is Bitchin Burgers. I feel like that truck is still trying to find its way as it originally started with burgers on ciabatta bread (luckily for me they moved beyond that), and now is mixing the cheese with the patty. Not only does this seem to lessen the serving size of the meat to the customer since it is measured to 1/3 lb, it also seemed to remove some of the juiciness of the burger. Curiocity suffered from execution issues when I visited, but they could be churning out great burgers now. Finally Eat at Recess's burger suffers from the meat to bun ratio, which clouds the flavors of an otherwise successful buger.